Ecology Camp is divided into five groups of 24 campers each: Age groupings are approximately as follows, but may vary based on overall ages of campers enrolled in Ecology Camp. Yellow: ages 5 – 12. A mixed age group allows siblings/cousins/friends who range in age to be together. Your child is welcome to join the Yellow Group without a sibling or friend if he or she prefers a mixed age group of peers. There are always a good number of children who love a mixed age group and do not join the group with a sibling or friend. Why enroll in the same camp for six weeks? Ecology Camp is where we started, over a decade ago. When Common Ground Camp was founded, the only option was to sign up for a consecutive six-week session. We had the same campers all summer, and we got to know them really well. 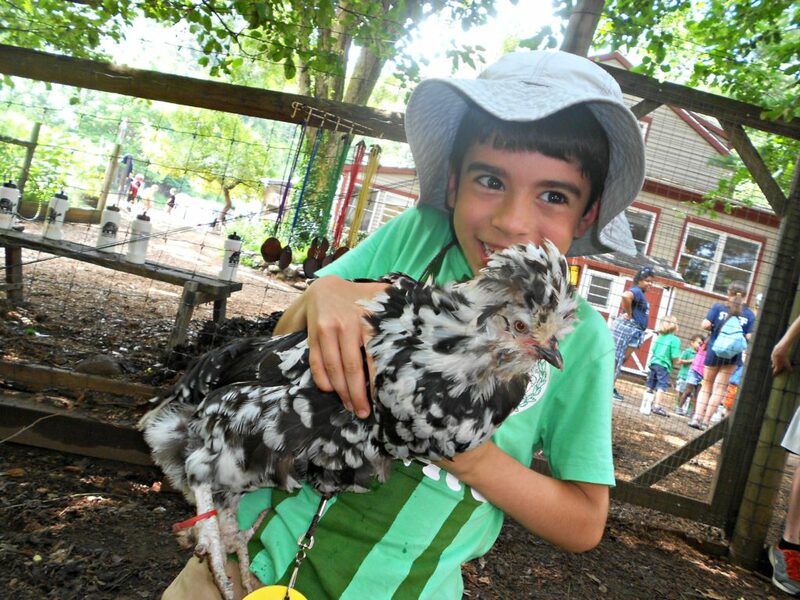 They learned the trails, named the chickens, and developed real relationships with the site, the staff, and each other. We have some amazing camp staff now who were those six-week campers over a decade ago. The experience was a very significant part of their early years and we are excited to offer the opportunity to children whose families are looking for a full summer of fun and friends. What makes Ecology Camp different from other camp options at Common Ground? The six-week session is an important distinction because it means that campers are with the same group of staff and friends for their whole camp experience. Our weekly camps have about 50 – 75% new children each week (with the remainder being children who are have already attended in previous weeks). In our weekly camps, each Monday is time for orientation – meeting new friends, learning camp routines, and exploring the campus. Ecology Campers only participate in orientation once, at the start of their six-week session. Additionally, Ecology Camp is our only camp to take field trips! Campers will board a yellow school bus twice each summer to enjoy adventures that are not available on our campus. Previous summer’s trips included a completing the East Rock/West Rock challenge, visiting a nature center and meeting the resident wildlife, and exploring some local parks. Ecology Campers will also enjoy some special on-campus assemblies and classes brought in by outside specialists. Details are still in the works, but we are hoping for hula hooping tricks, circus acts and skills practice, meeting some amazing wildlife and exotic animals, and more! There are no extra fees for field trips or special events. What do children do in Ecology Camp? Ecology Camp is for ages 5 – 12. Campers are divided into five different groups, and Ecology Campers stick with their group for activities, hikes, and field trips. Campers will be able to join friends or siblings who are not in their group for lunch and for choice time each day. 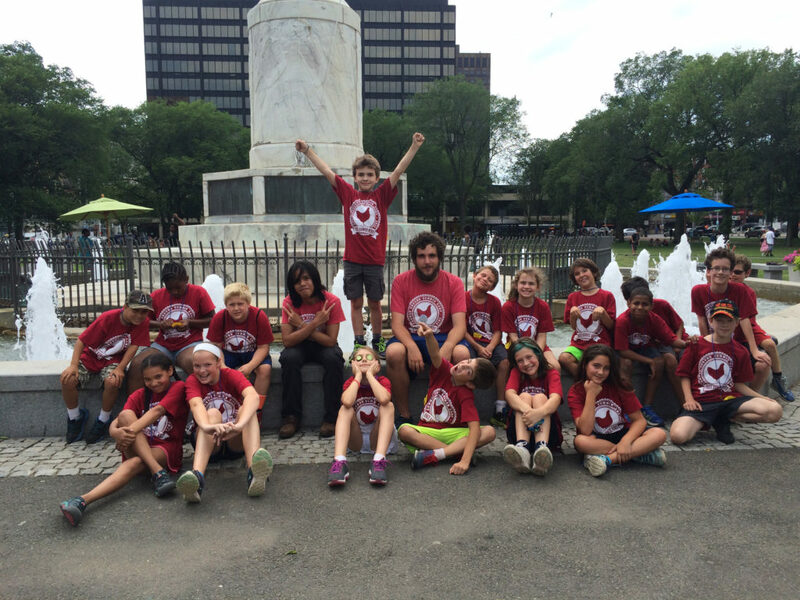 Ecology Campers have time over their six weeks to try a bit of everything at Common Ground. Cooking from the farm, nature exploration, farm animal care, science investigations, natural arts, hiking, games, music, and more! Ecology Campers also have some full day adventures in West Rock Park. They will bring a picnic lunch and head to a destination in the park – Judge’s Cave, the Summit, Lake Wintergreen, or everyone’s favorite – stream day! A typical week of Ecology Camp includes one off campus field trip or special event, one day-long adventure in the woods, and three days where campers participate in on-campus activities. Who are the Ecology Camp staff? The Ecology Camp staff are chosen to make sure we have specialists in many different kinds of activities. Some staff love to cook, others are awesome game leaders and hikers, some may love leading activities with the animals, and others may be talented musicians or artists who enjoy sharing those passions with children! In addition, all of the teachers in Ecology Camp have significant professional experience caring for the needs of children. Please see the “Frequently Asked Questions” page for more details on the qualifications of our camp staff. Camper/Staff ratio: Each group of 24 children is joined by two teachers, an assistant teacher, two high school aged counselors, and one or two Junior Counselor volunteers.